Sukamade is a village located on the middle of a national park, Meru Betiri National Park on the southern part of East Java. To get here will need a bit of adventure. It will need 4 wheel drive car or at least a good SUV car. Dense rain forest with gravel and stony road like a dry river lead you to the village. There are some attractions which guide people to visit this remote area. One of the interesting attraction is the Green Turtle. 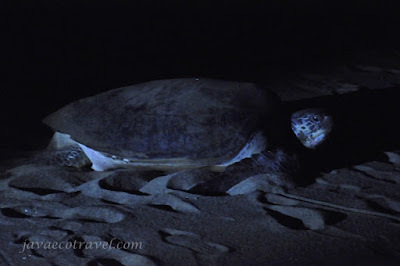 Around 45 minutes drive from the village there is a bay where many Green Turtles lay their eggs. This bay called Sukamade Bay. Almost everyday, one or two turtle landing on the beach to lay their eggs on this sandy bay. Accompanied by rangers, the visitor are allowed to witness the process of this beautiful creature lay the eggs on the seashore. If you are lucky you will also witness baby turtle coming out from the nest. Please check our video below.